Posted July 26, 2017 by admin & filed under City Hub. Local businesses are taking it upon themselves to fill vacant shopfronts on Oxford Street, as the City of Sydney continues to allow the streetscape to decline. It has been reported that short-term tenants of 66 Oxford Street recently vacated the building impacting the profit of nearby café Greenhouse Coffee. However, City Hub understands based on the building’s directory that this would mean up to eight spaces at 66 Oxford Street remain empty, a third of the overall spaces. The DBP has partnered with local tech start-up DeepLine. Together DBP and DeepLine want to fill the mass of vacant shops along Oxford St by learning what locals and visitors want in order to invigorate the world-famous strip. “We are operating under one of their grants and they do invest more than any other council. But I believe the model is flawed and they’re not investing nearly enough if you consider that business rates net them $200 million a year,” he added. 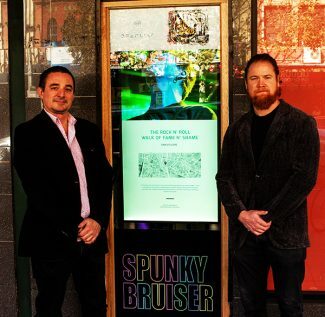 Christian Olea, is the owner of Spunky Bruiser, one of the businesses picked by the City of Sydney’s Creative Spaces program to fill Foley Street. He said “[On Oxford Street] at the moment it’s not very busy, it’s not what it used to be, who knows why? There are so many factors – lockouts, prices on shops increasing, traffic with the bus lanes which stop people from parking on the street,” he said. The City of Sydney is reported to have spent around $3 million paving Foley Street in September, last year but the laneway sat empty for several months before the Creative Spaces tenants moved in. Council moved Spunky Bruiser and four other tenants onto Foley Street three months ago. Mr Olea is hoping the DBP and DeepLine initiative will attract more businesses (and shoppers) to the area. Mr Gyory said the Council’s adherence to time frames was lacklustre. “The plan was always to relocate them to Foley Street, it’s just that it took the council 8 years to do Foley Street,” he said. The Council is the largest stakeholder in Oxford Street and owns most of the property on the north side between Hyde Park and Taylor Square. Since opening in 2005 the Westfield Bondi Junction shopping centre has been blamed by Oxford Street businesses for the consistent downturn in trade. Only four months after the centre first opened, retailers in Oxford Street noticed a 30% drop in trade with the trend continuing over the past decade. Mr Gyory said “For all they’re [Council] saying about the lockouts they’re not really doing very much about them, they don’t manage their villages, they have no sense of management or sense of strategy like Westfield, which has a centre management team – they do all sorts of things to ensure their shops are full. The DBP and DeepLine have installed a pilot display screen on Oxford Street adjacent to local clothing designer Spunky Bruiser, which asks the local community and visitors in Darlinghurst to use the DBP social media channels accompanied by the hashtag #IWishThisWas to help identify what is needed to curb the shop vacancies in the area. Following the launch of the pilot display the DBP is hoping to install more screens along Oxford Street should the initial campaign prove successful.